Baskin-Robbins Valentine’s Day Teddy Bear Ice Cream Cake – So Sweet! I have partnered with Baskin- Robbins on a sponsored post for their Valentine’s Day ice cream cakes. All opinions are 100% mine. 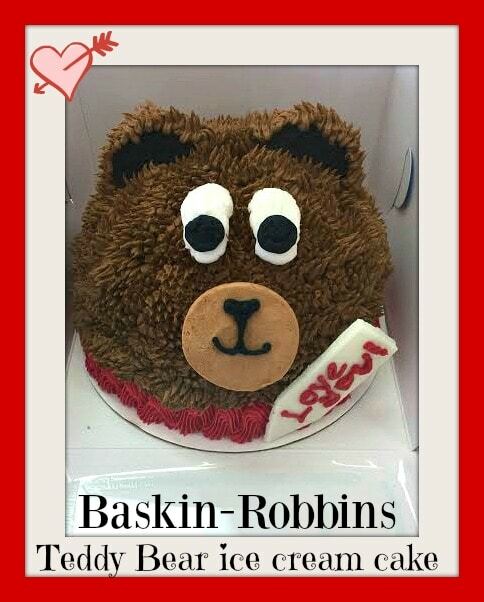 Seriously, how sweet is this Baskin-Robbins Valentine’s Day Teddy Bear Ice Cream Cake? With a coat made out of chocolate icing, ears made out of OREO® Cookies, an edible red scarf, he is sure to put a smile on your face. What is your favorite Baskin-Robbins ice cream flavor? The customization of your cake is easy. The hardest part is choosing which flavor of Baskin-Robbins ice cream you want for the inside of your cake. You can pick any flavor including classics like Pralines ‘n Cream, and Rocky Road. I almost went with Chocolate Chip but then saw the February Flavor of the Month, Chocolate Hazelnut and that was a delicious choice. It is made with chocolate ice cream and contains chocolate-covered hazelnuts with a hazelnut cookie fudge ribbon woven through the ice cream. *Tip – if you are drooling over the Chocolate Hazelnut description, you can also enjoy the ice cream in a cup, cone or as a milkshake. Since we are serious chocolate fans, I chose chocolate cake over vanilla and that was very tasty choice too. Order Online – It’s So Easy! Click over to Baskin-Robbins and browse through their gallery of ice cream cakes or create your own customizable cake. Your cake can be customized with one of up to 16 Baskin-Robbins ice cream flavors like Mint Chocolate Chip, Jamoca® Almond Fudge or OREO® Cookies ‘n Cream, and one of two cake varieties, Chocolate or Vanilla. If your cake is for a birthday, you can even add birthday candles to your order. 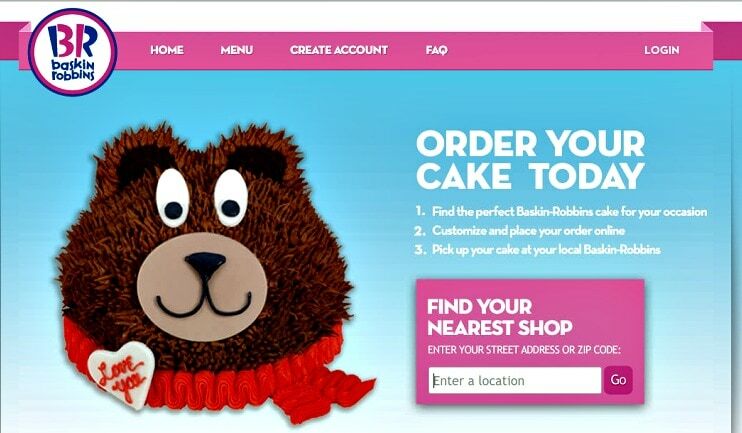 When placing your order online, you choose the date and time to pick up your cake at your closest Baskin-Robbins store. Your cake can be ready in as little as 24 hours. If you are pressed for time, you can always head to the store and chose one of the delicious cakes that are ready to go. Since Valentine’s Day falls on a Sunday this year, you may want to order online and pick up your ice cream cake on Saturday to give you an extra weekend day to enjoy it. I was delighted with how my cake turned out. Wouldn’t this custom ice cream cake be the perfect sweet treat for a February birthday too? You can just change up the message on the white chocolate message tab. Also, available are Baskin-Robbins’ Conversation Heart Cakes in two sizes, the Small Conversation Heart Cake which is perfect for two and is adorned with rainbow sprinkles; and the Large Conversation Heart Cake that serves 10-12 people and is decorated with heart-shaped pink, red and white sprinkles. You can feature a fun Valentine’s Day message such as “Hug Me,” or customize a message for your sweetheart. Baskin-Robbins was founded in 1945 by two ice cream enthusiasts whose passion led to the creation of more than 1,200 ice cream flavors and a wide variety of delicious treats. They are the world’s largest chain of ice cream specialty shops with more than 7,400 retail shops in nearly 50 countries, including nearly 2,500 shops in the United States. In addition to ice cream and customizable ice cream cakes, they also offer frozen beverages and sundaes too! What is your favorite Baskin-Robbins flavor? You know my new favorite, Chocolate Hazelnut. How cute is that cake? I want to go to Baskin Robbins this weekend and go get one! The cake is adorable! It’s great that you can customize it and not just buy one off the shelf! Glad you guys enjoyed it! Such a cute cake! I wish we still had a Baskin Robbins in our town. How delicious! I love Baskin Robbins! Love this ice cream cake! Woah that is adorable love how cute the cake is! Aw, this is adorable! I need to get this ice cream cake for the twins. 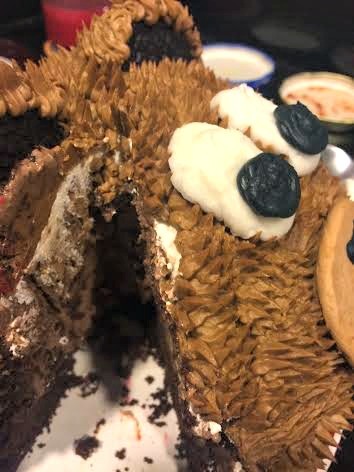 Oh my goodness this cake actually looks fuzzy! We don’t have a Baskin Robbins but this looks delicious! Oh my goodness! I did not know they had a teddy bear ice cream cake!!! I love it! BR has the best ice cream cakes ever. I’m so glad to see they’ve gotten very creative with their selection. I have to get this for the next birthday party! The Teddy Bear ice cream cake is absolutely darling, but I’m partial to those conversation hearts around Valentine’s Day! They are super cute and make me smile! We had something similar here but we can’t order it online. We just go to the store. I love Baskin Robins ice cream cake. I have not eaten these in a long time though. you had me at ice cream. lovit it. such a cute idea!